IgE or Immunoglobulin E is an antibody in human blood. Antibodies are our body soldiers to fight harmful substances like bacteria and viruses and hence antibodies protect us from diseases and infection. IgE antibody sometime overreacts to certain substances called allergens e.g. eggs, dust, pollens. This overreaction leads to a high level of IgE in blood and is an indication that the body is facing an allergic reaction. IgE Test measures the total level of IgE in the blood which may confirm existence of allergy. This test is ordered by doctors to confirm that the symptoms like sneezing, asthma, skin irritation etc. are due to allergic response of the body. 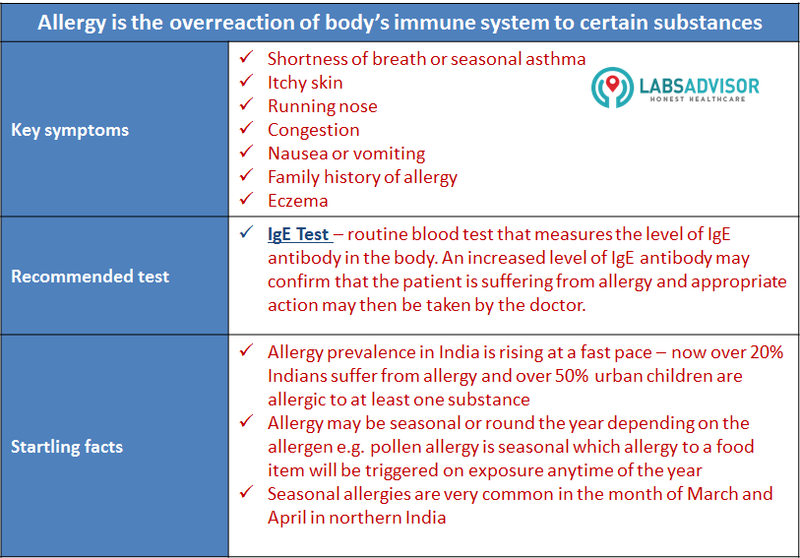 IgE test or IgE Total test is ordered in cases where allergy is suspected. IgE test gives the level of IgE in blood. A high level of IgE usually confirms that the tested person is facing an allergic reaction. However, this test does not confirm which allergen is causing allergy. For that a more detailed allergy panel test may be used. Allergy panel test may be used to check for the specific allergen that is causing the allergic response in the patient.